Paul Frampton drug case could take years to resolve. Particle physicist Paul Frampton is in an Argentinian jail after allegedly being caught trying to leave the country with drugs concealed in his suitcase. He claims he was not aware of the drugs and has “plenty of evidence” but any optimism he may have for a quick release is likely to fade slowly. The case is eerily reminiscent of New Zealander Sharon Armstrong who was caught in Argentina in April last year in very similar circumstances. Her trial began seven months later. She is still there and the case could take years and lots of legal fees to settle. Frampton could be in for a similar ordeal. Everyone passing through international airports will know that they must pack their own bags and be responsible for the contents. Travellers are continually warned and asked about it. It is easy to be befriended especially in honeypot traps. The details of how Frampton may have been tricked are not yet known but similar stories are well-known. Cases have even been turned into films such as Bangkok Hilton. It will be hard for an intelligent professor to persuade his prosecutors that he was naive enough to innocently accept to use a suitcase with cocaine stuffed into the padding. We wish him luck. For other reports see NEW and TRF. Update 22-Mar-2012: The Telegraph has provided more details of the case confirming what I suspected in my first post, that he was a victim of a honey-trap. Unfortueatly this does not make things much better for him. The authorities in these countries expect people to take responsibility for the contents of the luggage they carry. Even if they believe his story of incredible gullibility he may still be considered guilty. Sharon Armstrong got four and a half years even though they accepted her similar story. The Argentinians do not have much sympathy for the English at a time when cruise liners are being turned away from Argentinian ports because they have visited the Falklands Islands. Argentina sees the Islands as poorly defended by the British Navy and may try to take advantage, leading to a worsening of relations between the countries. Frampton has not made his situation better by initially refusing to talk and then attacking his employer back home for cutting off his salary. He will need some very good friends to help him if he wants to keep his sentence as short as possible. Framptons prospects for bail will have taken a nosedive following the news that the High Court in London has blocked the extradition of Lucy Wright this week. The heavily pregnant drug mule who had admitted her attempt to smuggle 6kg of cocaine skipped bail in Argentina and fled the country to avoid her jail sentence. It seems unlikely that the Argentinian authorities will now risk giving the same chamce to Frampton. In the circumstances I am afraid to say that Frampton should consider himself lucky if his eventual sentence is nearer the lower end of the 6 to 16 years given for this offence. They may well decide to make an example of him and make it much longer. Given his age and doubtful mental health it is not obvious that he could survive the conditions for that long. I only hope that he can find a legal team and enough good friends to help improve his chances. In a cermomy at the Norwegian Academy od Science and Letters today it has been anounced that this years Abel Laureate for mathematics is Endre Szemeredi for for his fundamental work in discrete mathemtics. The prize will be presented by the King of Norway in May after which the winner will go home with 6 Million Norwegian Kroner. Szemeredi made a breakthrough when he showed that certan general sets of numbers have arbitrarily long arithmetic sequences. A lemma in the proof has been particularly useful in theoretical computer science and was descirbed as a “game changer” in the subject. 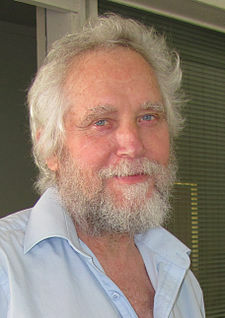 Tim Gowers gave a summary of his discoveries. The Large Hadron Collider has celebrated π day by sending protons round in a giant circle. 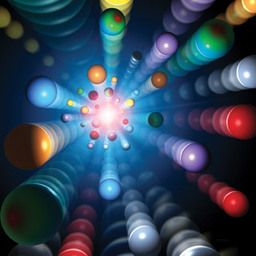 This marks the start of operations for 2012 with collisions at a new record energy of 8 TeV due in a couple of weeks. Beam 1 which turns counter-clockwise was successfully sent all the way round the ring a few moments ago. Beam 2 will complete its round tour shortly. The plan for the next couple of months will no doubt be to get to last years luminosity and beyond as quickly as possible, hoping to produce 5/fb of new data in time for the big ICHEP conference in July. Update 16-Mar-2012: Two days on and beams have now been ramped to the new energy of 4TeV for the first time, fast work. I am saddened to hear of the passing of Ray Munroe on who died on March 11th. Many readers of viXra Log will know of him through his web presence and his love of physics. Last year his FQXi essay which ended in 27th place, a very respectable result for an independent researcher. 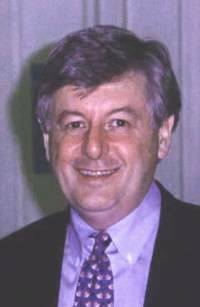 He had worked professionally as a physicist studying cosmic rays and liked to be known as Dr Cosmic Ray. His last comments here were left just a month ago when he said “I’m excited to be living during such ground-breaking times.” His obituary can be read here. Our condolences to his family, we will miss him too. … or perhaps I should be calling it the “Brout-Englert-Higgs” Summary or even the “SM scalar boson” Summary. These were the titles diplomatically chosen by the speakers in the presence of François Englert who gave the opening talk for the session, but the particle is still symbolised by just the letter H.
The Moriond meeting has seen another small step forward in the search for the missing boson with new data coming from the Tevatron and LHC experiments. Now that all the plots are available online it’s a good time to pick out a few highlights and see what they are telling us. These are comfortably consistent with a Higgs between 115 GeV and 135 GeV and could accommodate a wider range. 2.2 Sigma is not a high significance level but in conjunction with results from the LHC it is a nice independent confirmation of what they are seeing. There is one further point to make about this result that is very important and so far overlooked. The Tevatron is getting its signal from the bb channel. Below is my unofficial combination for the decay channel to two bottom quarks alone. 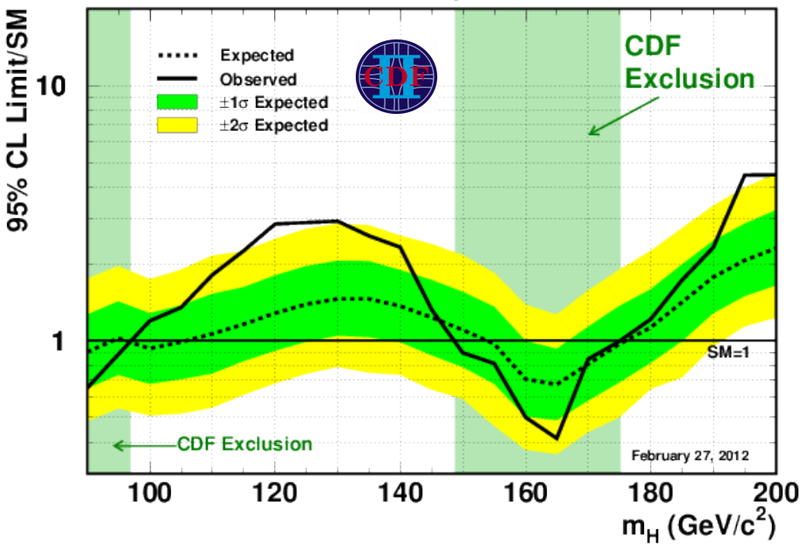 CDF and D0 were able to get a lot more information out of this channel than previously by improving their algorithm for identifying the hadronic jets coming from these decay products. It is not an easy business and results in a widely spread excess as seen here. 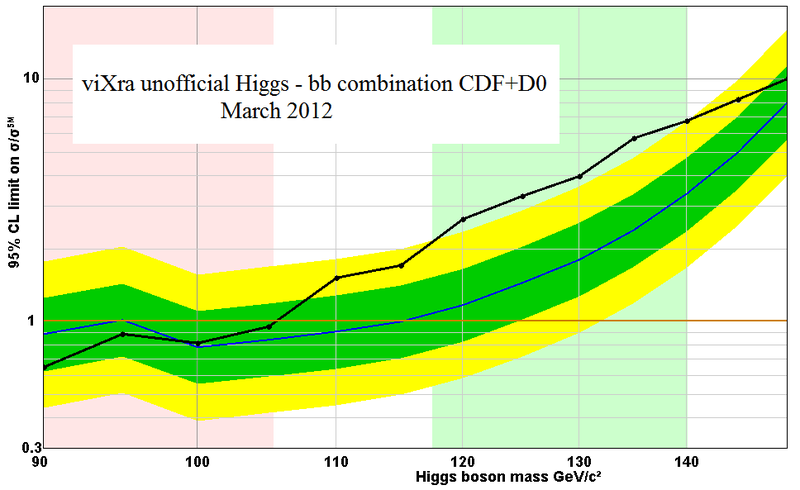 What makes this especially interesting is that this shows the Higgs decaying to two spin-half fermions. The LHC has so far only had tentative signals in the diphton, WW and ZZ channels which are all spin one products. Spin in conserved in the decay process so a scalar boson with its spin of zero can decay into two particles of equal spin orientated in opposite polarisations so that the total spin cancels out. the experiments cannot measure the orientation of the spin so if they see two photons (or W or Z bosons) they can only say that the spin of the original particle was zero or two. Someone wanting to be argumentative could say that the particle being discovered is a graviton like spin two boson. However, if we take the Tevatron excess to be a signal of the same particle then we also know it can decay into two spin half fermions. That would indicate a particle of spin zero or spin one. Putting the two results together we know that it can only be spin zero which is a nice confirmation for the theory of the Higgs mechanism. 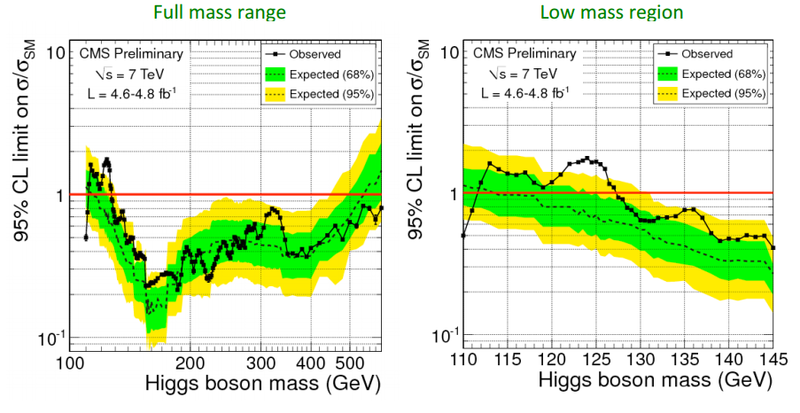 It will be a long time before the LHC can get a similar result from the bb channel so this observation makes the Tevatron result much more than just a small confirmation. Following the Tevatron presentations ATLAS was next up to present. After the major update in December they still had a number of channels to update to use the full 5/fb of data collected in 2011. This included H -> ττ, H -> bb, H-> WW -> lνlν, WW -> lνqq, ZZ -> llqq and ZZ -> llνν. Of these only the first three are relevant to the low mass scale of interest. The H -> ττ, H -> bb do not have much sensitivity yet so no excess was expected there. This leaves only the H-> WW -> lνlν channel to be of any real interest. Here is what is looks like at low mass. 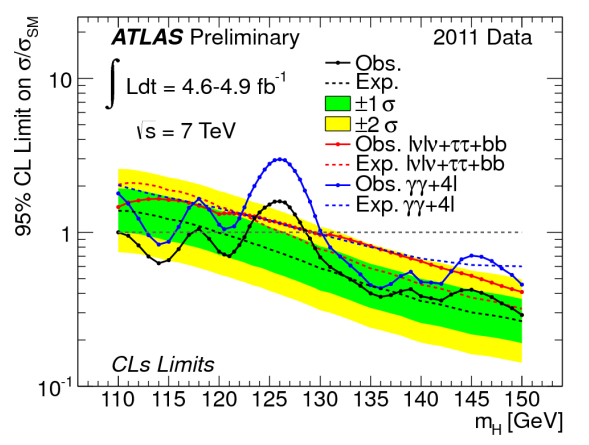 There is not much excess in this plot so the effect of updating it is to drop the combined excess for ATLAS at 125 GeV from 3.5 sigma previously to 2,5 sigma now. Here is what it looks like. Some media outlets such as New Scientist are reporting this as a “fading” signal. There are two points that need to be made to mitigate here. Firstly, the WW channel has very low mass resolution made worse in the latter part of the run by increasing event pile-up. 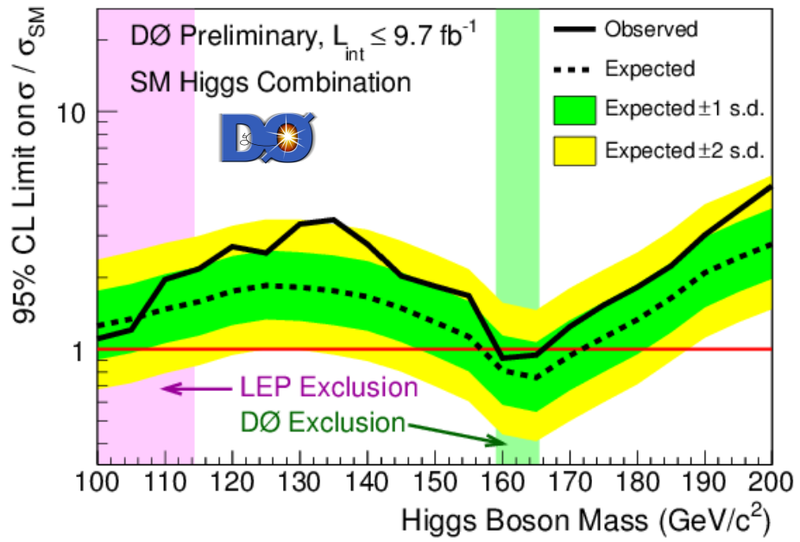 We should only expect a broad excess in this plot rather than a nice peak indicating the mass of the Higgs boson. Let me quote again something I said about this back in September last year. “Our expectation is that as more data comes in a sharp peak (or two) will emerge somewhere in the low mass region to reveal where the Higgs is. However, the plot is dominated by the WW channel over most of this range and the WW channel has low resolution. This is because it uses missing energy observations to construct the underlying mass of the events. The W’s decay into neutrinos which can never be detected directly. 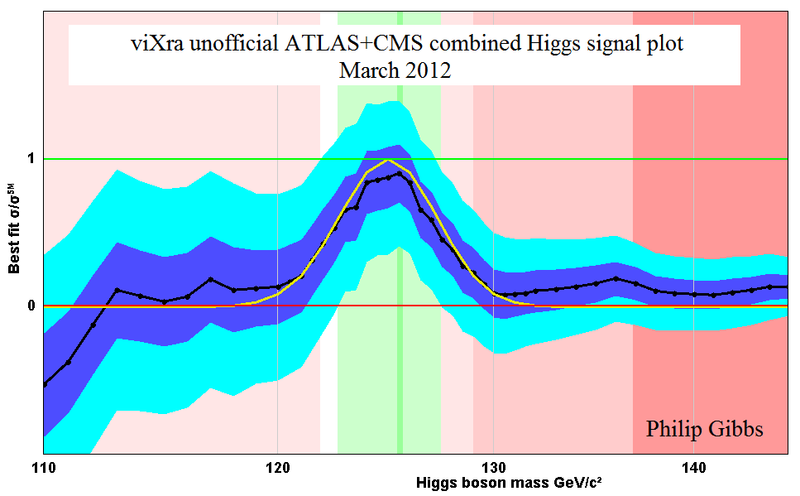 The result is that the Higgs appears as a broad excess in the WW channel and you can’t locate it well. 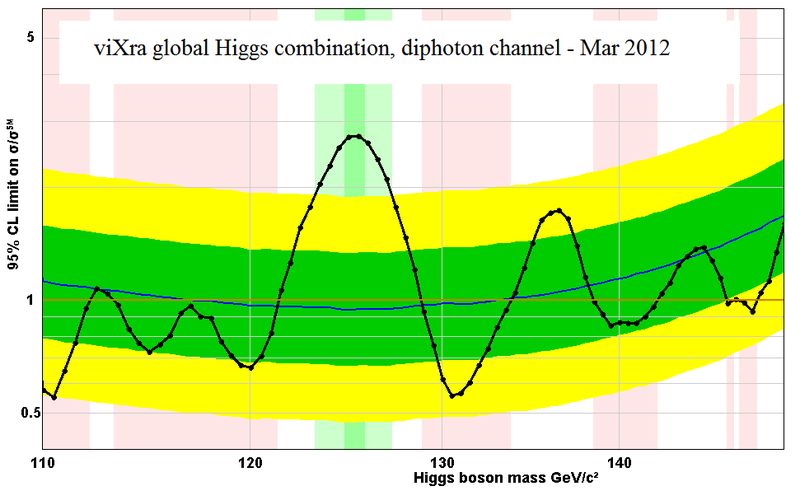 The WW channel is great for excluding large ranges of the mass spectrum, but it is not good for pinpointing a low mass Higgs that has a narrow width. In other words the WW channel does not help the combination and is best left out, but they would not want to be accused of cherry picking so it stays. They have however given us this complicated version of the plot that shows separates the low resolution and high-resolution channels for just this reason. My second point is that the current excess in the diphoton channel is actually a little larger than the standard model predicts. This can be accounted for as a statistical fluctuation, but likewise the deficit in the WW channel is consistent with a normal fluctuation in the opposite direction. In fact the combination with its now weakened excess is now closer to what the standard model predicts and we should be happier! They even managed to find some completely new channels such as WH-> WWW. The result is yet another new CMS combination. This now excludes the full range of masses except a narrow window from 122 GeV to 128 GeV. This is a remarkable achievement when you consider that at Moriond 2011 a year ago the LHC could tell us essentially nothing about the Higgs boson. 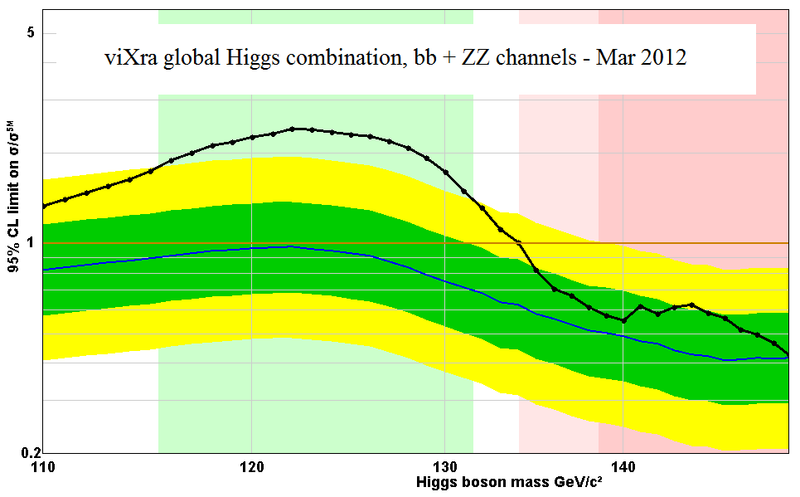 There is still a long way to go but I certainly think the case for a standard model Higgs boson at around 125 GeV now looks good. 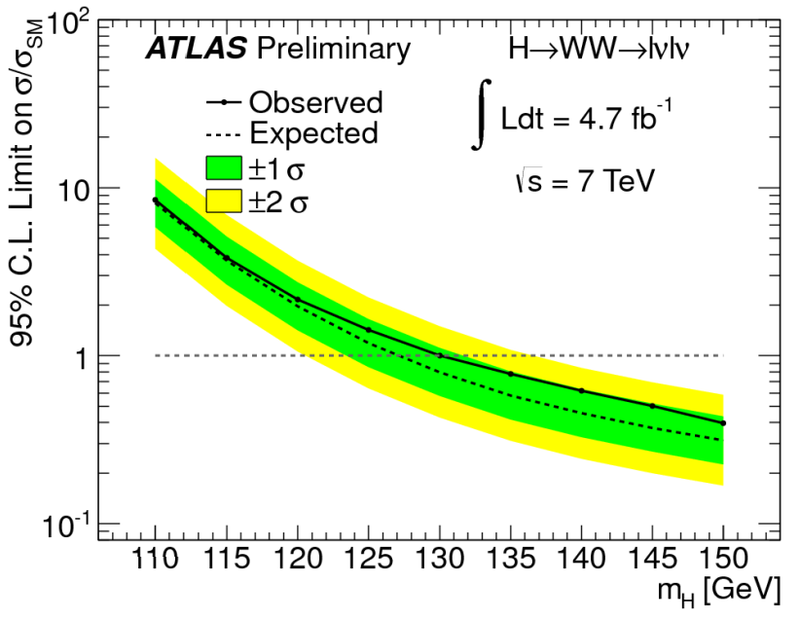 Even the outside possibility for something more at a lower mass below 120GeV has now faded with the LHC combination excluding that region. It remains hard to get a combination that combines to give an overall significance above the crucial 4 sigma level and we may have to wait some time for that. 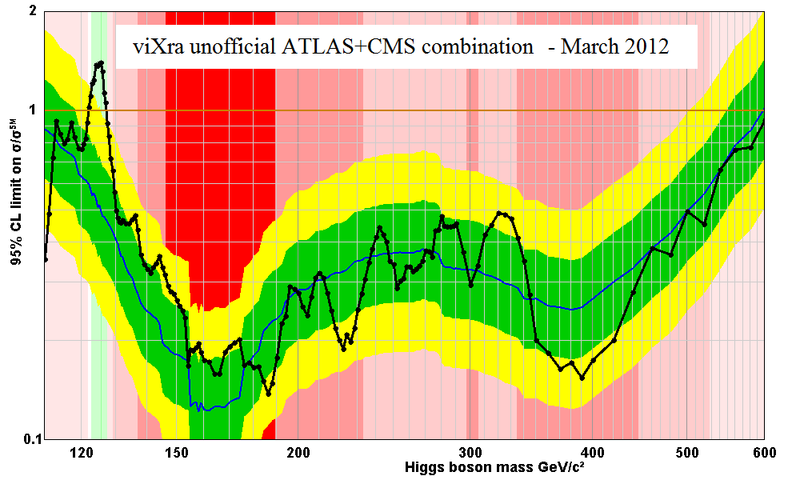 Finally I leave you with this impressive plot of the combined Higgs signal from ATLAS and CMS. You are currently browsing the viXra log blog archives for March, 2012.